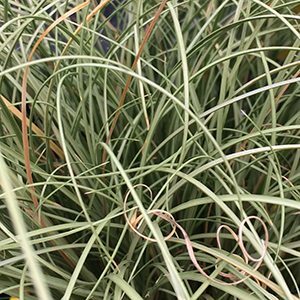 A fast growing tuft forming grass like plant, Carex Frosted Curls is used as a landscaping. The foliage is very fine with a natural drooping or curling habit. It is the silvery green foliage that is the main attraction, small flowers in summer are insignificant. Suited for use on banks to stabilise soil in difficult areas, very attractive in clumps in a rich garden and also suited to growing near the margins of ponds. Although this is a low growing plant, it is not suitable for use in areas or foot traffic. Once established this is very low care plant. It grows well in a range of soil types including dryish soils. It is not a grass that requires mowing or pruning and it requires little to no fertiliser in good soils. In poorer soils, a general purpose slow release fertiliser in spring will be beneficial. If you wish to improve the look of older clumps, instead of pruning, you can tidy up the older dead tufts by using a rake to gently pull them away from the tuft. Easy by dividing established clumps is early spring. In good conditions this is a plant that will set seed, propagation from seed is possible. Climate – Warm temperate climates to Cool Temperate. Soil Humus – Tolerates wet soils and this little sedge also tolerates dry conditions better than most. Position – Part shade, to full sun with some shelter from strong winds. Foliage – Mid pale to silvery green, fine with a dropping or curling habit. Flowers – Small pale yellow. Frost tolerance – Very light frosts only, better in frost free zones.